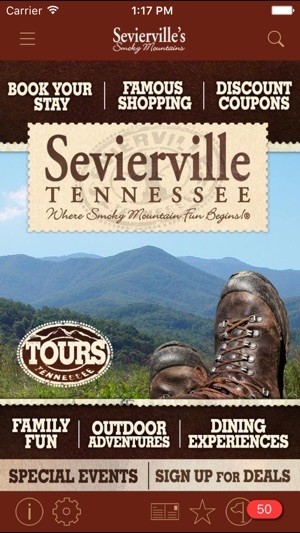 Discover hidden gems, local favorites and travel deals with the Sevierville’s Smoky Mountains app - a fun and informative way to explore Sevierville, Pigeon Forge and Gatlinburg, Tennessee with GPS guided tours and money-saving coupons. 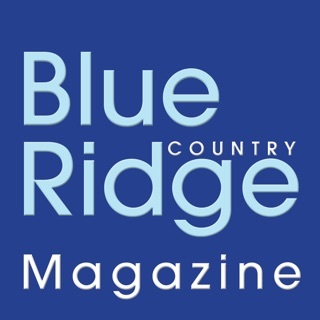 Plus, get great savings in the Smoky Mountains with downloadable coupons for hotels and restaurants, attractions and shopping in Sevierville, Pigeon Forge and Gatlinburg. Take the tour of historic downtown Sevierville, the eighth oldest town in Tennessee. Snap a photo with the bronze statue of Dolly Parton on the courthouse lawn and use our searchable coupons to get the best deals at Sevierville’s outlet stores. Then travel to hidden spots for authentic southern cuisine in the foothills of the Great Smoky Mountains. 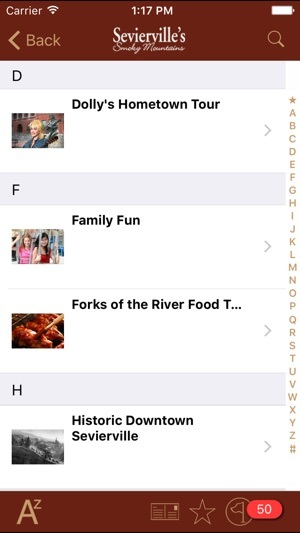 The Sevierville’s Smoky Mountains app also highlights major attractions in Pigeon Forge and Gatlinburg as well. 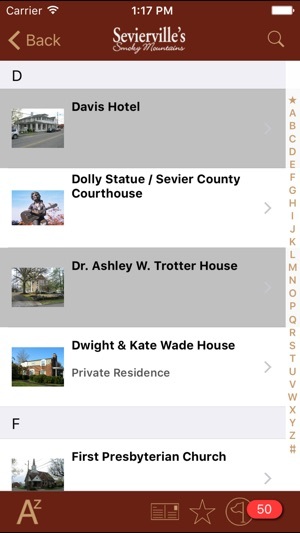 Like a guide book, the Sevierville’s Smoky Mountains app highlights 150 locations in the Smoky Mountains area, uses GPS enabled coordinates to show point you to nearby shopping, attractions, lodging and restaurants and provides valuable coupons right on your phone. 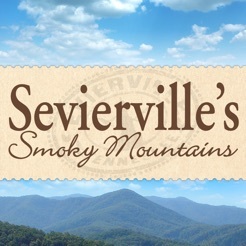 What else does the Sevierville’s Smoky Mountains app offer? -Popular tours, including one that focuses on locations in downtown Sevierville that figured prominently in the life of Dolly Parton. 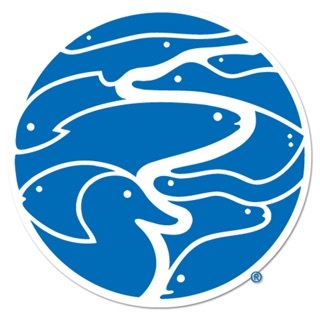 -Interactive, zoomable GPs maps that indicate your current location and all the included points of interest on the tour (must have connectivity for maps). -Full color, image slideshow files that share the history, culture, stores and behind-the-scenes information about what you are seeing. -Multiple tour media access points: find desired tour stops from the map or a full tour stop list in Sevierville, Pigeon Forge and Gatlinburg. -Location-based tour stop triggering: as you explore, a dynamic list of the tour stops nearest your location will continue to refresh. -Tour stop images will help you orient yourself to your surroundings and find points of interest quickly. -Additional embedded information such as phone numbers, websites, photos, social media links, applicable coupons, routing to address and text information deliver all the information you need for each tour stop. 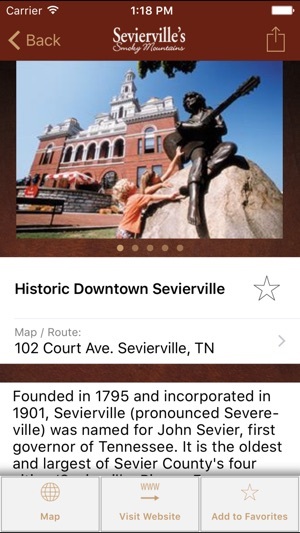 The Sevierville’s Smoky Mountains app has an easy to use interface that enables you to quickly download the application and start enjoying the tours, deals and fun of Dolly Parton’s Hometown, Sevierville, Tennessee within a few seconds! After you’ve downloaded the application, choose to stream or download the tours, coupons and more as you explore Sevierville, Pigeon Forge, Gatlinburg and the Smoky Mountains. The streaming format saves hard drive space on your device and avoids the time association with large downloads. However, downloaded material and tours can be enjoyed without Wi-Fi or 4G connectivity (which is important if you plan to access the app while in the Great Smoky Mountains). 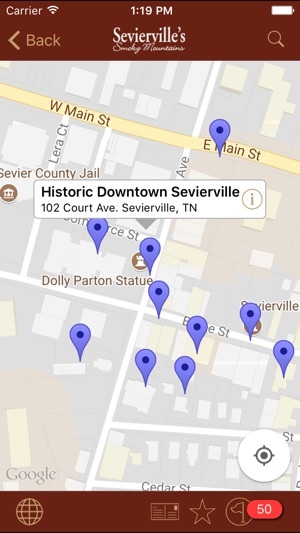 Download the Sevierville’s Smoky Mountains app now and start enjoying all the history, shopping and fun in Dolly Parton’s Hometown, Sevierville, Tennessee. Click on discount coupons and it says no listings. Click on book your stay and nothing comes up. There's a list of places to shop and a very limited list of places to eat. Pointless app. Great app to research things to do, where to go in the Smokey Mountain area. Such a great app. You have to get it. I Booked my hotel. Planed my trip. Saw things I didn't even know they had their. Great coupons. Got the app on my phone. Will use every time we go back which is very often. Two thumbs up 💗💗😄😄. Thanks Bunches.